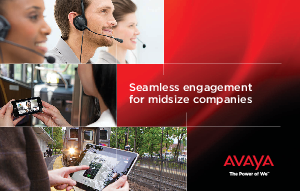 That’s the challenge in today’s mobile, virtual business landscape as companies strive for consistent communications between employees, business partners, and clients. Too often, a remote working world can feel splintered, disconnected, and complicated, resulting in lower productivity—and lost opportunity. Your customers, too, can feel neglected and misunderstood if they can’t reach you in the way they choose. What you need is a rich, seamless environment, one that is flexible enough to allow everyone to engage where and when they need to—to collaborate effortlessly and sacrifice nothing in the process. It’s the difference between simply doing business—or doing business simply.